The new FR-A870 690V inverter line-up from Mitsubishi Electric provides a complete range of models capable of addressing higher power requirement applications in areas such as the water industry, food and beverage and machine building. 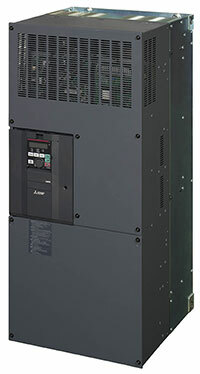 Mitsubishi Electric has extended its inverter portfolio with a 690V version of its FR-A800 series inverters. The new models of the FR-A870 690V line cover power outputs up to 1.5 MW. Yet this increased power is delivered in a slim package that starts at just 380mm wide, offering significant space saving potential. Furthermore, the FR-A870 line combines this high-power performance with features which enhance functionality, including a built-in brake chopper on all power sizes up 200 kW to shorten deceleration times. Numerous applications in areas such as the water industry, food and beverage and machine building are characterised by high power requirements. The flow demands of larger pumping applications in the water industry, for example, means motors are often oversized. The FR-A870 models optimize such applications, while incorporating features to reduce energy consumption and improve system reliability. In the food and beverage industry, where the likes of refrigeration compressors require inverters with greater power capability but where space within the control room is at a premium, the slim design of the FR-A870 is a particular benefit. Additional features include a DC reactor and EMC filter which remove the need for external ancillary components, and combine with the slim design of the FR-A870 itself to save further space and reduce wiring requirements. Along with the energy saving and optimised power usage functions of the FR-A800 range, the new FR-A870 models also comprise a host of other standard features, including integrated PLC, USB port for programming and parameter copying, an easy-to-read control panel, functions for improved system safety, three expansion slots and a choice of network card.